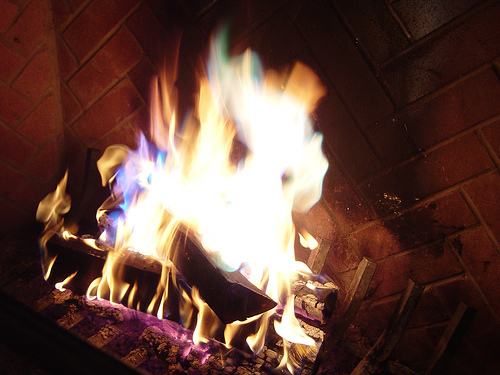 Yes, some of the flames are blue and green. We’re just that fancy. The Trans-Siberian Orchestra’s “Christmas Eve/Sarajevo 12/24” combines “God Rest Ye Merry, Gentlemen” with, you guessed it, “Carol of the Bells.” Did you think I had forgotten about that song? I first got into the song when I was a freshman in college, and I heard it playing across the hall in Brendan‘s room. I rushed over and asked him what it was, and have been playing it at Christmas ever since. In our previous house, there was a fun tradition where at the start of the holiday season, the neighborhood would suddenly be alerted to a fire truck driving down the street with lights and sirens activated. The kids would run out of their houses, to greet the truck because on the truck was Santa Claus, waving and distributing candy canes. The year before we moved, I’m pretty sure that I was at least a little disappointed that along with the ice cream truck, we would no longer have an annual holiday visit from a fire truck in our more rural location. On a cold winter’s night, a fire in the fireplace really makes a home feel like a home. It’s so delightful. Some may not see work done on the chimney as an improvement. Shortly after we had moved into the house, my uncle was complimenting the recessed lighting just after we had a smoke issue. “I love how you can just see the beam shining down,” he said. It was illuminating the smoke. 5th in a series of Christmasy things. We had a similar issue once, at a New Year’s Eve party. It turns out I sealed all the windows and doors in my house too well – so there was no downdraft, but no incoming air to allow much to go up the chimney. Our guests were amused but not impressed with my homeownership skills. lol, you have the most hilarious blog I read.